Today's students find that computer hardware and software are just as essential to their studies as textbooks. Unfortunately, the cost of buying a laptop, printer, other hardware, plus basic and specialized software adds up very quickly. But you can get help from academic discounts on hardware and software. Vendors offer academic discounts for several reasons. A school may negotiate discounts for its students as part of a larger deal for the campus infrastructure. Vendors may hope to capture customers while they are young and impressionable. You may hear vendors offer student discounts out of the goodness of their hearts, but don't believe it. Whatever the reason, discounts on hardware and software are widely available for students as well as qualifying staff at educational venues. In some cases, you get software free of charge for use in an academic setting. The Microsoft DreamSpark program is one example. Your school's IT department is a good place to check for student discounts. Many schools negotiate volume licensing agreements for products that will be used by the entire student body, as well as faculty and staff. The school's bookstore is another good source of discounts on hardware and software. But be careful. 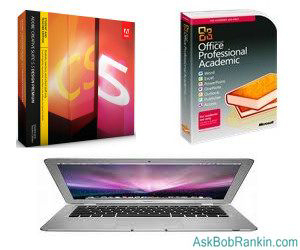 Bookstores may offer academic pricing on certain products required for which the school has negotiated good deals, but prices for non-essential hardware and software can be high. The bookstore is not the best place to buy video games, or bluetooth headsets or other tech accessories. Then there are online stores like Academic Superstore, where you can purchase over 20,000 products that are discounted up to 65 per cent. The biggest savings are on software, but you can also save money on notebooks, netbooks, peripheral devices, and even backpacks in which to carry it all. A few current examples are Rosetta Stone Spanish for $332 (regular price $499) and the 32GB Surface RT tablet for $299 ($200 discount). Another online store specializing in academic and student discounts is JourneyEd. Vendors may offer academic discounts directly to students, faculty, and employees of schools. Apple, Lenovo, Microsoft, and Adobe are just a few examples. Sometimes vendors' sites offer promotions that are not available elsewhere, such as a $100 credit to spend in the Apple App Store when you buy a Mac. Amazon Student is a free program created especially for college students. Members get six months of FREE Two-Day Shipping with Amazon Prime, and e-mail alerts for other discounts and promotions. Of course, you'll need to prove that you are eligible for an academic discount. That may be as simple as providing an email address at a qualifying school's domain. But you may need a student or staff ID number, and you may have to pick up your purchase at the school's bookstore or other on-campus location. In some cases, you will have to login to a portal website operated by your school, and click through to the offer from there. And what's even better than a discount? Free, of course! So be sure to check out my article GOING FREE: Replacing Your Paid Software to find out how to get free software for word processing, internet security, backup and other common tasks. You'll also want to see my tips on How to Get Free College Textbooks. Most recent comments on "Academic Discounts On Software and Tech Gear"
You can pick up some real good deals when you are in college. That also applies to computers and software. You just have to ask once you start school. How can this kid be going "back" to school when he says it's his first year? Two weeks before September and NOW he's starting to look for laptops? And why does starting college mean he needs a new laptop and some software? If money is tight, bring along what you're using already. And if you think software is going to be so expensive I have a bridge or two for sale you'll just love. I've been into computers probably since before this kid was born and I never had to pay anything for software; enough comes preinstalled or is available free online. Laptops? Look ahead and shop things like Wal-Mart's Black Friday sale. That way you won't be part of the crowd scene with all the other students seeking the same academic specials. Also, you should avoid tough majors, take gut courses. And stop whining. Be sure to do some comparison shopping. I was able to get a better deal on a laptop through my account than what my child was offered through the school discount - and got the computer she wanted rather than the model the school discount was offered on. My husband works for a large university. I've been able to pick up some really good deals on both software & computers. A lot of academic software I can download for free & whereas most people would pay fortune. I can pick up some good deals on laptop computers too, on & off campus. One time I bought some software on campus. Normally you would pay over $600. for it and I got it for under $200. I'm still using it today. Rosetta Stone recently acquired LiveMocha (a 'sell-out' move by LiveMocha IMO, but I digress), and LiveMocha members can now get a discount on Rosetta Stone software... 60% off is the latest offer that I've received. Very nice! I like Rosetta Stone but I use Tell Me More now because it comes free with a vacation club I joined.